Beautiful updated home across the street from the beach! Ocean views from living room, dining room and kitchen. Downstairs has 3 bedrooms. Master bedroom with queen size bed and private bathroom with shower & door to front patio. 2nd bedroom has a queen size bed, TV and a sink for your convenience. 3rd bedroom has beautiful custom made built in bunk beds (4 twins), TV and great storage for clothes, toys and entertainment. Upstairs has an open floor plan with ocean views! Updated kitchen with stainless steel appliances. Living room has comfortable seating and views of the ocean. 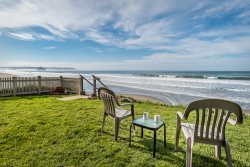 Large deck with ocean views, perfect for enjoying one of Cayucos’s famous sunsets! Grassy fenced in back yard with charcoal grill. Washer and dryer are located in the garage. IMPORTANT INFORMATION REGARDING AVAILABILITY CALENDARS: Please call our office to ask about any date inquiries for this home and verify availability. This is a month unit though one booking per month is considered.